Welcome back to the second installment of The Modern Borefare Interview, an occasional series of discussions with up-and-coming creators, writers, builders and DIY’ers of the comics/video game/pop culture scene. Modern Borefare: Tell the MB audience about yourselves! Diego Garcia: I’m Diego Garcia, a 25 year old man-about-town with a lusty passion for illustration and animation and, duh, games. Along with Emmett I’m ½ of Sugoi Papa Interactive, our little two-man, when-we-get-around-to-it dev team. I’m also pursuing an MFA in Game Design as part of the inaugural class of the NYU Game Center’s new program. Emmett Butler: I’m Emmett Butler, a 21 year old programmer and game designer, and I study computer science and music technology at NYU. I love Japanese food, SNES, and Magic: The Gathering. I’ve been programming, participating in lots of student organizations, and doing my own projects since the beginning of school. I also very occasionally make music. MB: What are you doing currently? DG: At this exact moment I am sitting at my desk answering these interview questions instead of doing work. I am a full-time student and work part-time in television and digital media. EB: Right now, like RIGHT now I just took a midterm! I work at a web startup and I go to school, trying to make games and learn lots in the in-between parts. I do some work in the open-source semantic web community, and I’m involved with Tech@NYU and their student hacker initiatives. MB:Can you talk about your projects a bit? Ultimate Flirt-Off, Dokideux Panikku, Heads Up! Hot Dogs…how long does it take to go from concept to completion? DG: Ultimate Flirt-Off was the first game I ever saw through to completion. It’s a quick-time response game, designed to replicate the awkward stressfulness of flirting with a stranger. Since I created the game as part of my grad school applications, I had a hard deadline of about two months to make it. I would advise anyone who works full time and doesn’t know how to code to give themselves more than two months on their first game (especially if they’re doing all of the art, too). We can both speak to the others – Dokideux was a molyjam (ed.note: Unfamiliar with a molyjam? Check it out here) game that we made in a total of about 10-12 hours one weekend. Faced with a time restraint like that, it was basically an issue of agreeing on a (SIMPLE) concept as quickly as possible, figuring out the tools to use, and diving in. Heads Up! 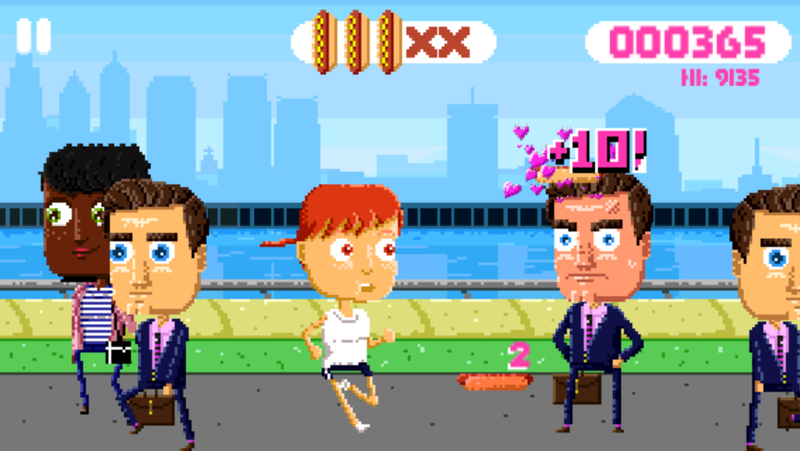 Hot Dogs is our brand-franking-new action touch game for iOS. It’s kind of a hectic absurdist space management game about putting hot dogs on people’s heads to save them from getting dirty and decomposing (also, hot dog puns). We’ve been working on it since January and just released with [adult swim] games. I think if we had been focusing full-time on this game, we probably could have completed it in a few months. But meeting less than once a week due to school and full-time jobs has drawn it out. That’s actually been kind of helpful, as Emmett has had a lot of time to get a better grasp of Objective C and we’ve been able to put a lot of thought into the game. EB: I don’t have much to add to this, just speaking to the mention of my lack of familiarity with iPhone programming. When I started writing Heads Up, I had more or less never touched iPhone code before, so obviously the first few months were a rough process. As you’d expect, though, I came out on the other side with a near-encyclopedic knowledge of the technologies I used – which is what one would hope for working on the same project for ten months. MB: You’ve now had two games you’ve worked on featured on Kotaku; describe that. Have you noticed an uptick in interest after those profiles? DG: Like I said before, Flirt-Off was my first completed game, and definitely my first public release, and I spent months convincing myself that it was no good, that nobody would play it and I would never get into school because it wasn’t polished enough and the dialogue tree is too limited and the character choices aren’t diverse and blah blah blah, I was really self-conscious about showing it to anyone. EB: Being featured on blogs is so weird. Heads Up is still this project that I think of as very personal, and I had to be deliberate about accepting the apparent fact that people were treating something I built as if it was a “real thing”. It’s a total confidence booster, but it’s also a bit scary as a one-man programming team – what if I missed a bug? I was really surprised the first few times we got featured though. MB: Who’s doing the music for you Heads Up! and how did that partnership come about? EB: The music’s being done by Knife City (Anamanaguchi’s drummer Luke’s solo project) and Space Boyfriend, two good friends of ours from the chip music scene, which we both follow closely. DG: I discovered Anamanaguchi 3 or so years ago and immediately became a huge fan. Shortly after moving to New York, I ran into Luke at a Guitar Wolf/Peelander Z concert. I never would have spoken to him, but I had THOUGHT I was missing an Anamanaguchi concert to be there. Instead, we split a cab to the other venue and I saw both shows. Now we’re working together. So weird! We met Space Boyfriend through the whole chiptune scene (and twitter). He thought I didn’t like him at first! MB: How long have you been making your own games? How do you like collaborating over working solo? Do you find you have to compromise on your ideas or you can actually flesh them out more? DG: I call Flirt-Off my first game, although I did do some sprite-replacement in high school, made lazy stupid things in RPG maker for Playstation, and made a terrible point and click in a basic ActionScript 2 class in college. And I guess as a kid forced to go to church, I used to draw death mazes on the pamphlets. Collaborating is amazing! Emmett and I are on a pretty similar wavelength, and with him doing code I can focus on art and give it my all. The only way we’ve ever had to compromise on things is in terms of what we have time to do. When we first started, it was really hard for me to not know exactly what was going on in the code and relinquish that control, but Emmett (seemed like he) actually knew what he was doing so it’s all for the best. EB: I love collaborating. I did a few small game projects myself before working with Diego, and they were all great learning experiences, but the process of working with another designer on a large time scale is so different from that. I had to learn how to balance feature requests with time, how to deliver working code at a reasonable rate, and probably most importantly how to compromise on design ideas without feeling like we were losing things. We definitely have to compromise, but I think they’re healthy compromises and that our styles mesh well together. It also helps that we’re total bros.
MB: What’s the best part about game design? The planning stage, the actual nuts and bolts creation, or when you’ve finished and you’re waiting on feedback? DG: For me it’s the conceptualization. I think that’s largely because I am lazy and like to lie around thinking about stuff and making myself laugh. Waiting for feedback is the worst! It’s so stressful! But getting it feels pretty good usually (beware the comments). EB: Seeing gameplay concepts go from abstract ideas in the mind of the designer to actual interactions that you can touch and feel. I think that’s a big part of the draw that I feel to software engineering in general: getting to help a design go from idea to implementation. It’s also an awesome feeling to have someone play the game you made and get some real enjoyment out of it – I love seeing people react to something that I made. As a programmer, it’s also really gratifying to see your creation not crashing and working properly after hours of head-smashing. MB: What’s the most under-utilized/under-appreciated part of game design? What’s the most misunderstood part? Which aspect, if it went away, would you miss least? DG: I don’t feel qualified to answer this, haha! We’re pretty laid back, come what may, see what sticks about this whole game. Testing and feedback is probably the most important part, because you start to recognize what the game needs added or what needs tweaking, and what needs removal. When you come up with an idea, it’s either fully formed and perfect, so testing helps you realize that’s not true and you need to work with it, or it’s totally incomplete and testing helps you figure out what the next question that needs answering is. For me, it seems like a misunderstood aspect of game design is the strange desire to pack games full of features and different types of gameplay. My favorite games are simple, streamlined, and don’t have any elements that work out of concert with the rest of the game. It’s one reason I can’t get into MMOs. Get all that HUD business out of here. The aspects I would miss least are financial requirements/stresses. It’s depressing to put things in for the sake of a buck. EB: It’s crazy to think about the amount of untapped potential in game design. For every insane idea there are hundreds more, and I’m of the philosophy that there probably exists a way to make most ideas into viable game mechanics. I like to stay optimistic about it. Thank you Diego & Emmett for participating! Come back tomorrow for part 2, where Diego & Emmett discuss art style, inspiration, going to grad school for game creation & their top five favorite games! Please check them out on Twitter (Diego, Emmett) , Box vs. Box, Ultimate Flirt-Off and Heads Up! Hot Dogs for iPhone and iPad in the iTunes store! Pingback: 11.13.2012///NYTech Meetup’s Academic Night held @ Skirball Center for the Performing Arts | StartUpSay!